Franklin Castle has a tower, turrets, balconies, stone outcroppings, gargoyles, wrought-iron fixtures and fences.The Gothic-style Franklin Castle is said to be Ohio’s most haunted home. 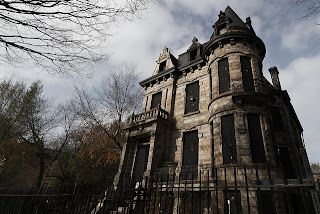 Built in 1860 for Hannes Tiedemann, an immigrant from Germany who became a wholesale grocer-turned-banker, he was either an evil tyrant or he was a decent and hard-working man who faced unfortunate circumstances. On January 15, 1891, Tiedemann's fifteen-year-old daughter Emma succumbed to diabetes. The house saw its second death not long afterwards when Tiedemann's elderly mother, Wiebeka, died. Over the next three years the Tiedemanns would bury three more children, giving rise to speculation that there was more to the deaths than met the eye. There have been many owners of the home including a German singing society and a church group. It's currently owned by an Internet businesswoman who wanted to renovate it and turn it into a B&B and hold “haunted mystery weekends,” however a fire in 1999 made her change her plans.